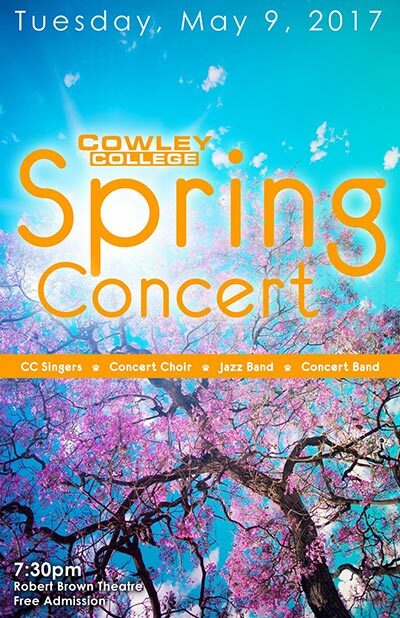 Cowley College is inviting the public to attend its spring concert on Tuesday, May 9 inside the Robert Brown Theatre. The concert will feature performances from Cowley College’s Concert Choir, CC singers, Jazz Band and Concert Band. There is no cost to attend this exciting event. The concert band will present North American Scenes featuring “Buffalo Jump Ritual”, “Shenandoah”, and “Night Journey”. “Buffalo Jump Ritual” is a musical adventure that recreates the drama and excitement of the hunt, as well as the symbolism and the rituals and ceremonies which were an important part of that experience. “Shenandoah” is a setting of the traditional folk song about the Shenandoah Valley and the Shenandoah River located in Virginia. “Night Journey”, inspired by Theodore Roethke’s poem of the same name, features both blues and jazz references, as well as allusions to the movement and machinery of the locomotive. Evan Ricker, director of instrumental music, said this concert is the culmination of a year’s worth of hard work and dedication by these outstanding student musicians. The CC Singers will perform two selections from their recent performance in Greeley, CO: “Seven Bridges Road” a tune recorded by the Eagles in the late 70's, and “My Funny Valentine” from the musical Babes in Arms. They will also perform an arrangement of Leonard Cohen's “Hallelujah”, and three songs from the movie O Brother, Where Art Thou; Down to the River, Siren Song, and Man of Constant Sorrow. The Concert Choir will perform an arrangement of “MLK”, a tribute song written by U2 in memory of Martin Luther King; “Sicut Cervus” a well-known Latin setting of Psalm 41:2 by the Renaissance composer Giovanni Palestrina, and “Es tu tiempo”, an original work by Francisco Nunez, the guest clinician at Friends University's Sing It! festival this year which the Concert Choir attended. In addition, the Concert Choir women are performing “Ouvre ton Coeur”, a little known French art song written by Georges Bizet (1838 – 1875) which sets the poetry of Louis Delâtre (1815 – 1893), under the direction of Lindsay Allen, and the Concert Choir men are performing “Prayer of the Children”, a song written in commemoration of the victims of the Bosnian conflict during the late 20th century. “This performance is going to be a lot of fun and is a great way for us to end our first concert season together,” Ricker said.